Last year, I shared some remarkable research from the Organization for Economic Cooperation and Development about the negative relationship between government spending and economic performance. 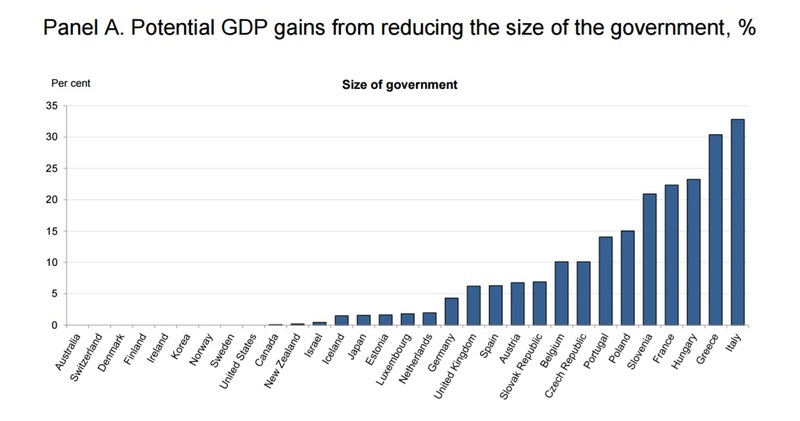 The economists at the Paris-based bureaucracy looked at data from its member nations (primarily Europe, North America, and the Pacific Rim), discovered that the countries with bigger government experienced less growth, and concluded that there would be much more prosperity if those nations merely reduced government modestly. So you can imagine what sort of numbers that study would have generated if a few jurisdictions with genuinely modest-sized government, such as Hong Kong and Singapore, were part of the data. But that’s a separate issue. Today’s topic is about a study from another international bureaucracy. The European Central Bank has new research looking at the impact specifically of excessive pay for government bureaucrats. Here are the key findings from the nontechnical summary at the beginning of the paper. …there are benefits from government wage bill reform that go beyond the objective of fiscal consolidation. 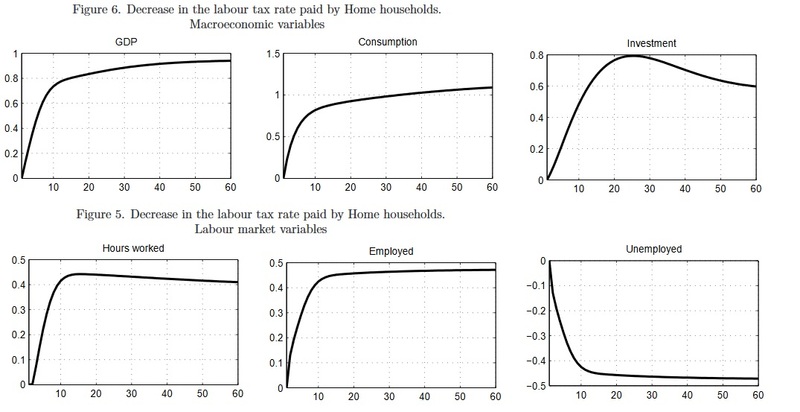 …a rationalisation of government wages and employment policies can generate favourable labour market effects in the medium to longer term through competitiveness and efficiency gains. Competitiveness gains materialise through the spillovers effects of public wage moderation on the determination of private sector wages. …An important aspect of the debate on public wage bill restraint concerns how long such policies can be sustained over time. …Additional margins of short-term adjustment include the moderation of still high public-to-private wages gaps, or a possible continuation of the downsizing trend in public employment, depending on the country-specific situation. …Finally, the paper argues that reforms affecting public sector personnel are most effective and have more sustained effects when the measures implemented are of a structural nature… Some examples are…measures to streamline the size and scope of government. Wow, an international bureaucracy writing about the economic benefits that accrue if policy makers “streamline the size and scope of government.” Be still, my beating heart! If you’re a policy wonk, you’ll like the fact that the study is filled with lots of interesting data and charts. …aggregate data show that the euro area government wage differential with respect to the private sector increased from 20% in 2007 to 25% in 2009, and subsequently fell to 23% in 2014. Here’s the relevant chart. The blue line, which links to the left axis, shows the degree to which bureaucrats are overpaid compared to the private sector. For the past 10 years, the “pay premium” has been in the 20 percent-25 percent range. This problem of excessive pay for the bureaucracy has been a growing problem. Though once the “austerity” era began about 2010, there was a bit of reform to bureaucrat compensation (in Europe, “fiscal consolidation” mostly meant higher taxes, but some spending restraint), particularly in nations that were forced to make changes because investors were becoming increasingly reluctant to lend them more money..
Here’s a chart showing bureaucrat pay as a share of GDP, with the blue bar showing the amount of economic output consumed by government workers in 2010 and the yellow dots showing the level in 2014. 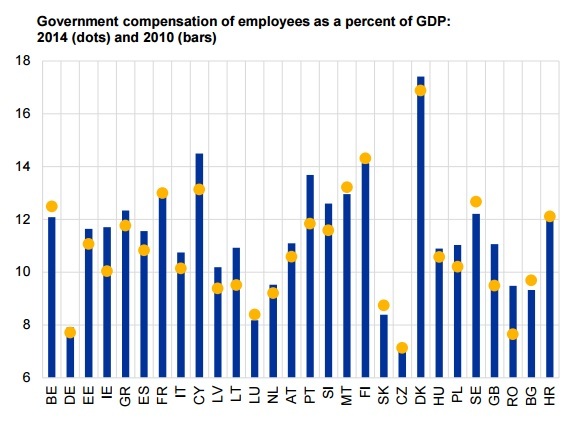 Some countries increased the relative burden of bureaucrat compensation and others reduced it, but what strikes me as noteworthy is that Germany and the Czech Republic deserve praise for keeping the burden low (honorable mention for Luxembourg and Slovakia) while Denmark stands out for being absurdly extravagant. 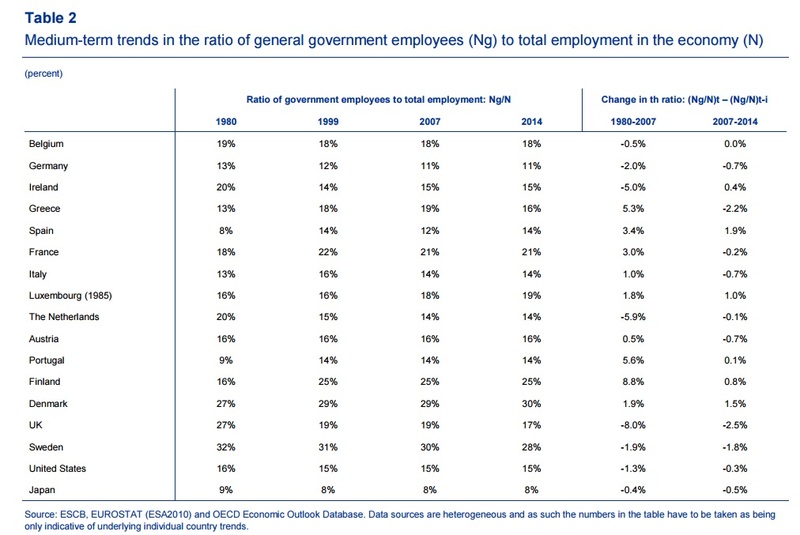 For a longer-term perspective, at least with regards to the size of the bureaucracy, here’s a table showing the share of the population getting a paycheck from government. Fascinating data. I especially like the columns on the right, which show that Ireland, the Netherlands, and the United Kingdom deserve credit for reducing over time the amount of bureaucrats relative to the private sector. The nations that have moved farthest in the wrong direction, by contrast, are Greece (gee, what a surprise), Spain, Portugal, and Finland. Now let’s get to the meat of the study, which looks at the economic impact of less bureaucracy. The authors cite some of the existing academic research, much of which focuses on the degree to which excessive pay for the public sector causes economy-wide distortions that make nations less competitive and result in slower growth. Basically, excessive pay for bureaucrats forces private employers to increase pay as well, but in ways that aren’t sustainable based on underlying levels of productivity. A seminal work Alesina et al. (2002) found that reducing public wage expenditure generates reductions in private wages per employee, which improves competitiveness, increasing profits, investment, and economic growth. …A key argument is that public wage restraint may set in motion a labour market adjustment through the inter-linkages with private wages. …The literature has found robust evidence of significant interrelations between public and private sector wages per employee. A wealth of recent empirical papers provides evidence of a direct causal relationship between these variables. …The empirical literature tends to find that public employment crowds-out private sector employment. But when fiscal pressures force politicians to cut back on the excessive pay for government employees, this enables the private sector to have pay levels that are consistent with sustainable long-run growth. The authors share some of their new findings. 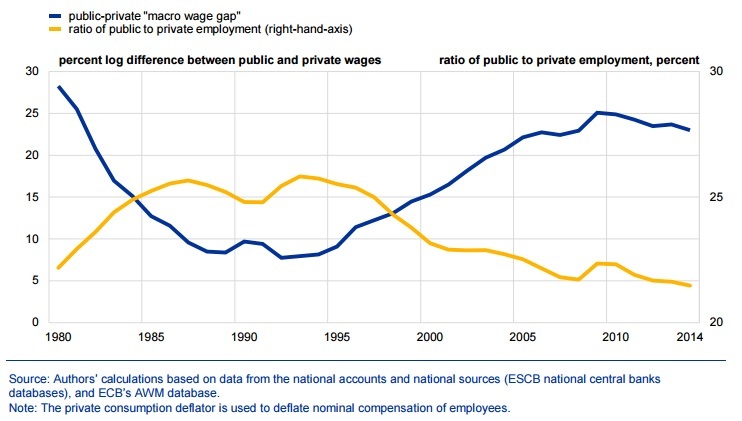 …the recent consolidation period has contributed to some competitiveness gains in the euro area, in view of the evidence provided on the partial correction of the public-private wage premium. …Overall, the restraint in public wages directly reduced unit labour cost (ULC) growth in the euro area during the 2010-2014 period. 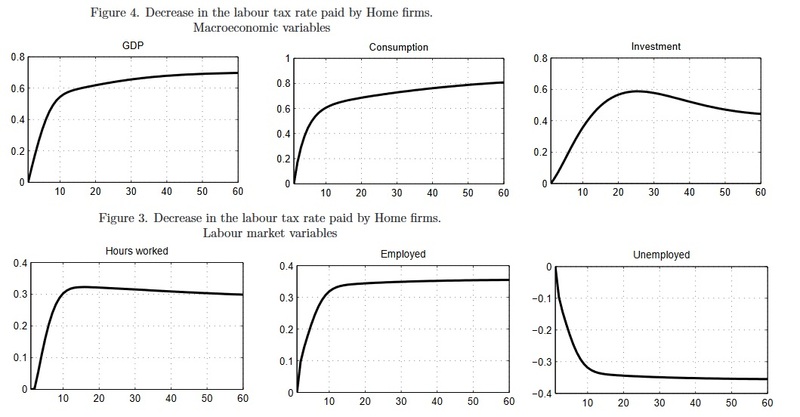 …The existence of distortions in public-private wage gaps…can be particularly harmful for competitiveness given that public sector activities are concentrated in non-tradable sectors, which are less exposed to international competition. …There is evidence that the recent public wage restraint has driven the partial correction of the existing positive public-private wage premium in the euro area. The authors close by discussing some policy implications. Well-designed government wages and employment policies and reforms may generate overall economy competitiveness gains and increase the efficiency of the labour market. …public employment adjustments can affect GDP and total economy employment positively if there are large inefficiencies in the government sector… In addition, if a public pay gap exists, the latter positive effect of public wage restraint becomes amplified as labour market inefficiencies are also reduced. This is helpful research. It’s not often that a government bureaucracy releases a study showing that overpaid bureaucrats hinder overall economic performance. Though I hasten to add that the study only looked at the macroeconomic effect of excessive pay. 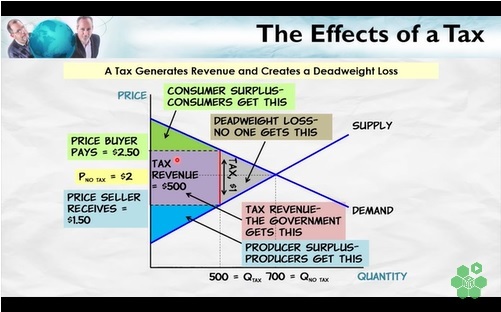 As I argue near the end of this video I narrated for the Center for Freedom and Prosperity, the additional problem is that various bureaucracies are engaging in activities that are economically harmful. In the case of the United States, the Department of Agriculture, Department of Education, and Department of Housing and Urban Development would be just a few examples of agencies where programmatic spending surely is more damaging that bureaucrat compensation. The bad news is that politicians don’t care about this consensus. But I then shared specific reasons for pessimism, including the fact that many European nations had the wrong response to the fiscal crisis. With a few exceptions (such as the Baltic nations), European governments used the crisis to impose big tax hikes, including higher income tax rates and harsher VAT rates. Combined with the fact that Europe’s demographic outlook is rather grim, you can understand why I’m not brimming with hope for the continent. And I’ve shared specific dismal data for nations such as Portugal, France, Greece, Italy, Poland, Spain, Ireland, and the United Kingdom. But one thing I’ve largely overlooked is the degree to which the European Central Bank may be creating an unsustainable bubble in Europe’s financial markets. I warned about using bad monetary policy to subsidize bad fiscal policy, but only once in 2011 and once in 2012. Check out this entertaining – but worrisome – video from David McWilliams and you’ll understand why this issue demands more attention. I’ve openly argued that the euro is not the reason that many European nations got in trouble, but it appears that Europe’s political elite may be using the euro to make a bad situation even worse. And to add insult to injury, the narrator is probably right that we’ll get the wrong outcome when this house of cards comes tumbling down. Instead of decentralization and smaller government, we’ll get an expanded layer of government at the European level. Or, as I call it, Germany’s dark vision for Europe. That’s Mitchell’s Law on steroids. P.S. Here’s a video on the five lessons America should learn from the European crisis. P.P.S. On a lighter note, the mess in Europe has generated some amusing videos (here, here, and here), as well as a very funny set of maps. Will Europe’s Feckless Politicians Destroy the Euro? As demonstrated by the new video from the Center for Freedom and Prosperity, there are five key lessons to learn from the fiscal crisis in Europe. Unfortunately, Europe’s despicable political class has not learned from their mistakes. They are not taking the simple and obvious steps that are needed to address the problems of spendthrift governments. Instead, they want to compound bad fiscal policy with bad monetary policy by having the European Central Bank purchase even more bonds issued by the continent’s most decrepit welfare states. I warned last year that this was a big mistake and I’m glad to see that the issue is now getting more attention. Here’s some of what the Wall Street Journal said in an editorial this morning. Only weeks into his new job as president of the European Central Bank, the Italian is being portrayed along with German Chancellor Angela Merkel as the main—the only—obstacle to saving the euro zone. If only the ECB would print a few trillion euros to buy the debt of spendthrift European countries, all will be well. 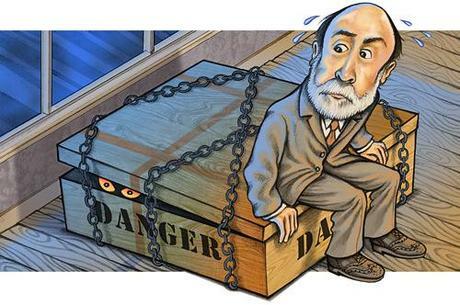 Hang in there, Mr. Draghi, and you too, Chancellor. Don’t let the French, the British and the Yanks, the euro-pundits and the other blabbering bullies for bailouts get you down. Someone needs to defend the principle of central bank independence and price stability. The ECB has been by far the most effective part of the euro system since its founding. It shouldn’t squander that legacy now by taking on the debts of spendthrift governments that are the real cause of this crisis. It’s true that the ECB has already become a little bit pregnant in buying sovereign bonds, first taking on Greek, Irish and Portuguese debt, and this summer Spanish and Italian bonds. A week ago Friday, the ECB held €187 billion worth of country bonds. …So far, the ECB’s bond purchases have been limited enough that the central bank has been able to “sterilize” them, meaning they are offset by withdrawing money elsewhere in the banking system and haven’t added to the overall supply of money. But a multitrillion euro program would make sterilization impossible and would become a money-printing exercise. …If the Germans and ECB do write a blank check, then the balance of power within the euro zone will shift markedly, and perhaps irreversibly, in favor of the spenders. Even if this prevented short-term panic, it would merely postpone the day of reckoning and leave Europe worse off in the medium and long term. Without a system that can enforce spending restraint, borrowing discipline and economic reform, all the ECB bond-buying in the world won’t save the euro, and the independence of the ECB itself will become another casualty of the crisis. The mess in Europe is like a slow-motion train wreck. It’s easy to see it won’t work, but that doesn’t stop the politicians from doing the wrong thing. Indeed, I predicted most of the bad policies. But it doesn’t require much insight to know that statism won’t work, as I acknowledged in my I-told-you-so post.